EVERY TEAM IS DIFFERENT, BUT ALL HAVE A common interest in the desired end goal. This is the reason the team exists. Pursuit of this end goal is the measure of a team’s success. It does not matter if a team is comprised of the best employees at your company; if they are not making timely progression toward a goal, the team is likely to fail. It may seem that selecting the highest performing employees would make the most successful team possible, however, grouping them together may not yield desired results.? High performers who lack teamwork skills are typically results-driven and eager to show managers how they alone have contributed to improving the bottom-line.Their emphasis on personal results can cause them to lose focus on what is in the team’s best interest. The foundation of a team should be high-performing employees who are also team players. Team players are excited to identify themselves as a part of the team, and this enthusiasm gets other employees excited. Every manager building a team should create them based on team players. 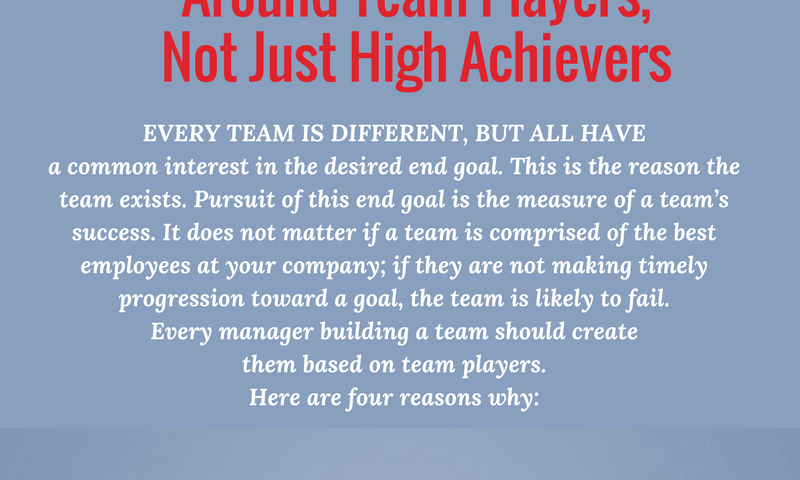 Download the infographic and find out the 4 REASONS To Focus Your Team Building Around Team Players, Not Just High Achievers by Profiles International.